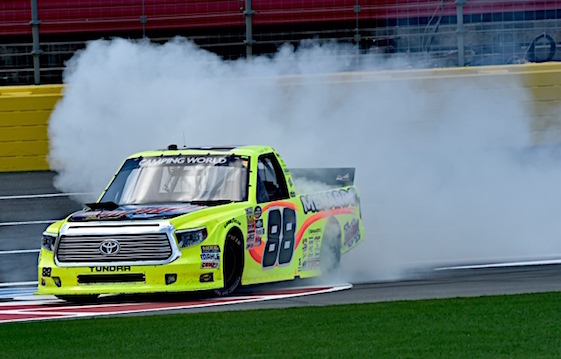 Matt Crafton drove to a 5.748-second victory over second-place Kyle Busch in Saturday’s NASCAR Camping World Truck Series race at Charlotte Motor Speedway. Crafton, the series points leader, credited a terrific truck. The victory was the 13th of Crafton’s career. And it came over one of the best in the biz. After starting 17th, Crafton moved forward during the first run but had major issues on pit road. The miscues forced Crafton to pass a number of cars, but by Lap 78 he was fourth for a restart after Christopher Bell’s spin off Turn 4, and two laps later, Crafton had the lead. The advantage grew to more than 8.5 seconds before a cycle of green-flag pit stops for fuel trimmed Crafton’s winning margin in the closing laps. Busch led 27 laps in the early going but suffered a suspension failure that caused the handling of his No. 18 Tundra to tighten up. Nor did it help that Busch’s team was penalized for an uncontrolled tire during a pit stop on Lap 68, forcing the driver to restart at the rear of the field on Lap 71. (17) Matt Crafton, Toyota, 134. (5) Kyle Busch(i), Toyota, 134. (4) Johnny Sauter, Chevrolet, 134. (6) Tyler Reddick, Ford, 134. (9) Matt Tifft #, Toyota, 134. (2) Spencer Gallagher, Chevrolet, 134. (20) Timothy Peters, Toyota, 134. (15) Christopher Bell #, Toyota, 134. (8) Daniel Hemric, Ford, 134. (1) William Byron #, Toyota, 134. (14) Brandon Jones(i), Chevrolet, 134. (21) John H. Nemechek, Chevrolet, 134. (16) Cole Custer #, Chevrolet, 134. (3) Ben Kennedy, Chevrolet, 134. (18) Cameron Hayley, Toyota, 134. (11) John Wes Townley, Chevrolet, 134. (12) Ben Rhodes #, Toyota, 134. (13) Parker Kligerman, Ford, 133. (23) Tyler Young, Chevrolet, 133. (10) Rico Abreu #, Toyota, 133. (24) Austin Self, Toyota, 133. (22) Ryan Truex, Toyota, 133. (7) Daniel Suarez(i), Toyota, 132. (25) Jordan Anderson, Chevrolet, 132. (28) Tommy Joe Martins, Chevrolet, 132. (19) Brandon Brown, Chevrolet, 132. (26) Bobby Pierce, Chevrolet, 130. (31) Jennifer Jo Cobb, Chevrolet, 128. (29) Garrett Smithley(i), Chevrolet, 111. (27) Travis Kvapil, Chevrolet, 106. (30) Timmy Hill, Chevrolet, Suspension, 82. (32) Andy Seuss, Chevrolet, Accident, 20. Average Speed of Race Winner: 141.855 mph. Time of Race: 1 Hrs, 25 Mins, 01 Secs. Margin of Victory: 5.748 Seconds. Lead Changes: 14 among 9 drivers. Lap Leaders: W. Byron # 1-25; T. Martins 26; R. Abreu # 27; K. Busch(i) 28-40; D. Hemric 41; K. Busch(i) 42; D. Hemric 43-56; K. Busch(i) 57-68; T. Peters 69-79; M. Crafton 80-122; D. Suarez(i) 123-124; K. Busch(i) 125; D. Suarez(i) 126-129; J. Sauter 130; M. Crafton 131-134. Leaders Summary (Driver, Times Lead, Laps Led): M. Crafton 2 times for 47 laps; K. Busch(i) 4 times for 27 laps; W. Byron # 1 time for 25 laps; D. Hemric 2 times for 15 laps; T. Peters 1 time for 11 laps; D. Suarez(i) 2 times for 6 laps; R. Abreu # 1 time for 1 lap; J. Sauter 1 time for 1 lap; T. Martins 1 time for 1 lap. Top 10 in Points: M. Crafton – 161; T. Peters – 149; D. Hemric – 144; S. Gallagher – 139; W. Byron # – 135; R. Truex – 129; J. Nemechek – 127; T. Reddick – 125; C. Bell # – 124; J. Sauter – 120.